Astrobiology is the study of the origin, evolution, distribution and future of life in the Universe. It attempts to answer some of the most fundamental questions we can ask, such as, “Are we alone?” and “How did we get here?” To answer these questions microbiologists, ecologists, geologists, astronomers, chemists and palaeontologists all work together to unravel their pieces of the puzzle. Over the last 20 years, astrobiology has developed a high profile, attracted the top scientists in their fields, and has laid the foundations for answers to our most profound questions. Historically, a discussion of the origin of life has centred on some primordial soup from which life miraculously sprang. Astrobiology has expanded this discussion to span the entire history and extent of the Universe. The study of how life began takes astronomers and cosmologists all the way back to the big bang. The early universe was filled with hydrogen and helium but some of the main elements of life (carbon, oxygen and nitrogen) were nowhere to be seen. Many of the hydrogen atoms in our bodies today have existed since soon after the big bang, but where did those other elements come from? The answer lies in the stars. Stars like our Sun produce heavier elements including significant amounts of carbon and oxygen. 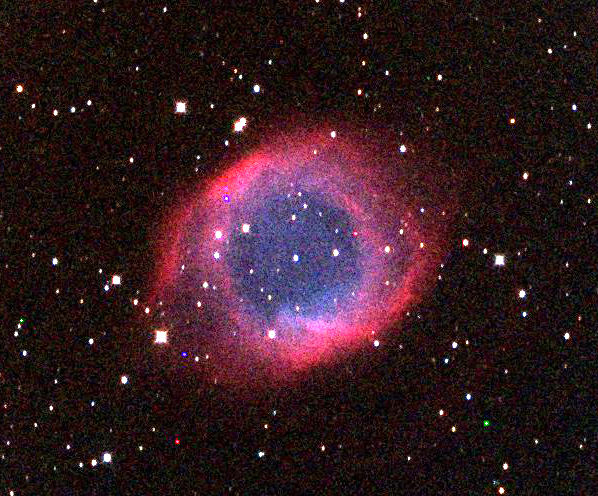 They spread these elements out into the galaxy when they end their lives as planetary nebulae (Figure 1). Larger stars produce the elements up to iron and end their lives in a supernova explosion. During these explosions they produce the elements beyond iron. These elements too become part of the tenuous clouds of matter between the stars. To have the elements we see around us today there must have been at least 3 or 4 generations of stars in our part of the galaxy before our solar system formed. These produced all the elements to make life possible and defined the time when life could exist in our galaxy. More complicated molecules have been found in meteorites. The Murchison meteorite which fell in Victoria in 1969 contains significant concentrations of amino acids. The meteorite smells like oil or diesel, which illustrates that it is packed with longer chain hydrocarbons. It is evident that amino acids, the building blocks of proteins, can be formed in space between the planets. We are left to ponder how significant these extraterrestrial molecules were to the formation of life. Or even if life began elsewhere and was transported here, an hypothesis called panspermia. Around 40000 tonnes of material fall from space onto the surface of the Earth every year. Most of this is in the form of fine dust and a significant proportion of this is organic compounds. So, even if life didn’t come here from elsewhere the early Earth was seeded with the chemicals of life by comets, asteroids, meteorites and dust from space. Even though the chemical reactions that created life are not understood, the widespread availability of carbon compounds in the Universe is a tantalising hint that life could be elsewhere. To better understand what Earth’s early life was like, palaeontologists and geologists search the fossil record for evidence. The Pilbara region of Western Australia is an epicentre of this research. 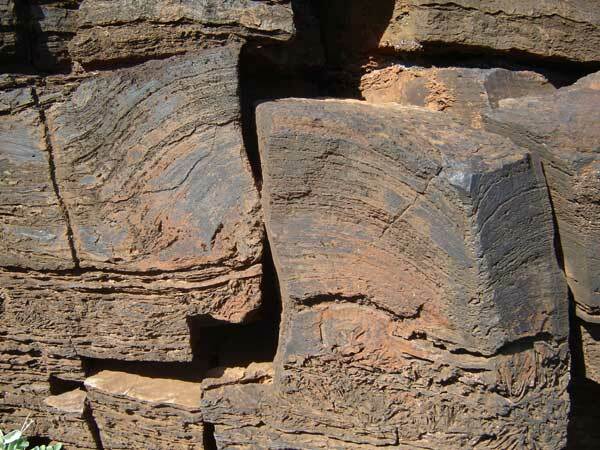 Fossilised stromatolites (Figure 2) abound in the hills of the Pilbara. 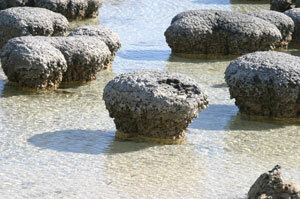 These place the formation of life on Earth somewhere between 3 and 4 billion years ago. Shark Bay in Western Australia contains the modern descendants of the cyanobacteria that build stromatolites (Figure 3). These provide a window into the past and attract microbiologists from all over the globe. These microbiologists are combing the genetics of living organisms in the search of the common ancestor for all life on Earth, the Last Universal Common Ancestor (LUCA). Mitochondrial RNA analysis has enabled biologists to build a tree of life that shows us the history of the development of life on Earth (phylogeny). At the base of this tree are the hyperthermophilic bacteria and archaea. Figure 4 shows the phylogeny of life on Earth based in mitochondrial RNA. The lighter coloured branches at the base are those occupied by the hyperthermophiles. These are organisms that live at extreme temperatures, close to or above the boiling point of water. 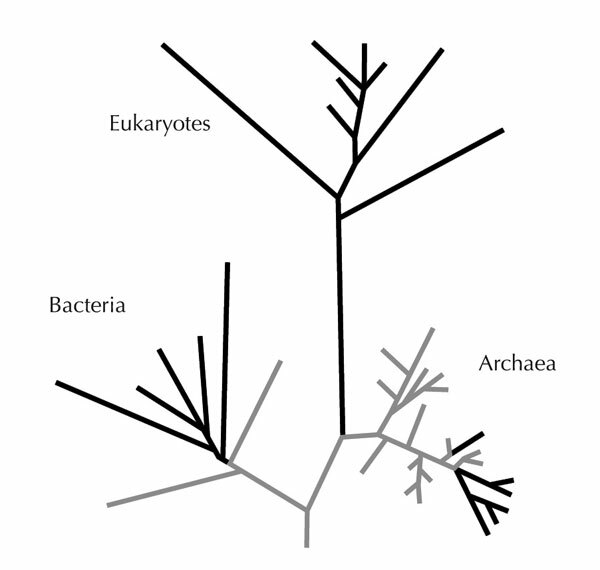 The position of these organisms on the tree of life points to a high temperature origin for life on Earth. This has guided the selection of ancient hot springs on Mars as places to search for life elsewhere. Life can still be found living quite happily at high temperatures. Whole ecosystems exist around hydrothermal vents along the mid-ocean ridges. These ecosystems thrive at the bottom of the ocean with no dependence on photosynthesis. Other deep ocean ecosystems rely on methanogenic bacteria feeding on methane ice as the basis of their food chains. These examples show us that life does quite well at extremes and may well exist where we least expect it. Some organisms thrive above the boiling point of water and well below freezing. Some thrive in salty brine, pools of acid and even in the cooling water of nuclear reactors. The universal ingredient in all these environments is liquid water. Our search has begun within the solar system and has focussed on places where water could reside. Spacecraft are now being developed that will search for habitable worlds in our galaxy. They will detect the signature of oxygen, ozone and water in the atmospheres of Earth-like planets. The major assumption is that where there is life there must be liquid water to allow for the chemistry of life. The future is sure to hold some surprises and the journey has only just begun.